Tucked away on the Welsh border, Shropshire is a quiet, rural county that’s surprisingly easy to reach from almost anywhere. This combination makes it a surprisingly good place to camp too. The Shropshire hills and canals make it perfect for walking and cycling, with traditional market towns like Ludlow and Shrewsbury offering cultural pit-stops amid the swathes of countryside. 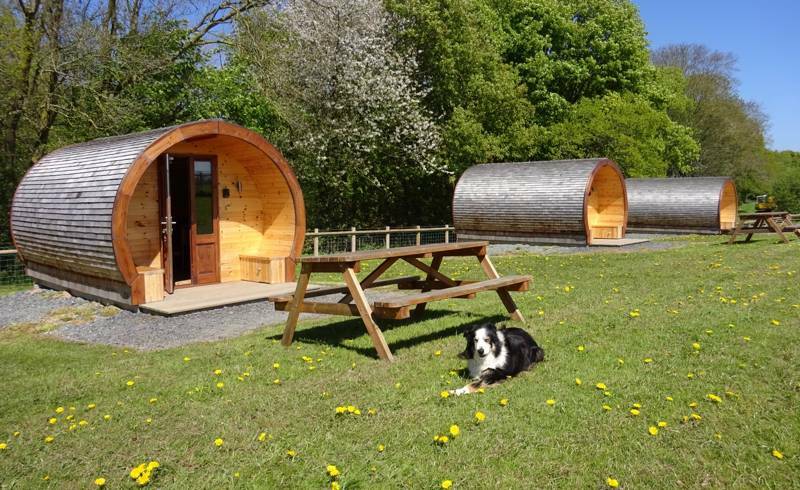 There are plenty of good campsites in Shropshire and there's a great choice of glamping too. As always, we’ve picked out only the very best for the Cool Camping collection. Quiet Shropshire is a place of rural charm despite having some pretty big attractions. This West Midlands county on the Welsh border was once home to a Roman city almost as big as Pompeii and it was here that the industrial revolution was born - and it has the UNESCO World Heritage Site to prove it. But even with these international wonders, it’s said to be the most sparsely populated county in Britain. It has lots of market towns but no modern cities. The canals and railway which served the county’s industries are now tourist attractions which showcase its beautiful countryside from the Shropshire hills to the seemingly endless farmland. All this makes it a great place for camping and glamping and we’ve been all over the county looking for the best campsites in Shropshire for our handpicked collection. There are plenty of places offering classic camping in Shropshire. The ones we pick to feature in the Cool Camping collection tend to be a little like Shropshire itself; quieter and more sparsely populated. We like places with big pitches and a little bit of personality which means they are usually independently owned and often have a bit of charm that you won’t find elsewhere. We love getting back to basics and pitching a tent and Shropshire offers plenty of delightful spots to do it. Stay in a tent, campervan or caravan and you can really enjoy the peace and quiet of rural camping by day and starry, unpolluted skies when the sun goes down. If you’re in Shropshire to walk in the hills, kayak down its canals or cycle along its country lanes, camping is the perfect partner offering a way to enjoy the outdoors for longer. It’s also one of the most affordable ways to holiday and has the least impact on the environment – and, of course, it’s lots of fun too. In fact, we love camping so much, that we think staying on site can be just as much fun as seeing the sights. Lucky then, that Shropshire has so many campsites with great views. There are campsites in the shadow of grand houses and Shropshire’s historic hills. There are campsites near the canals and waterways and campsites within easy reach of some of Shropshire’s most famous sites. 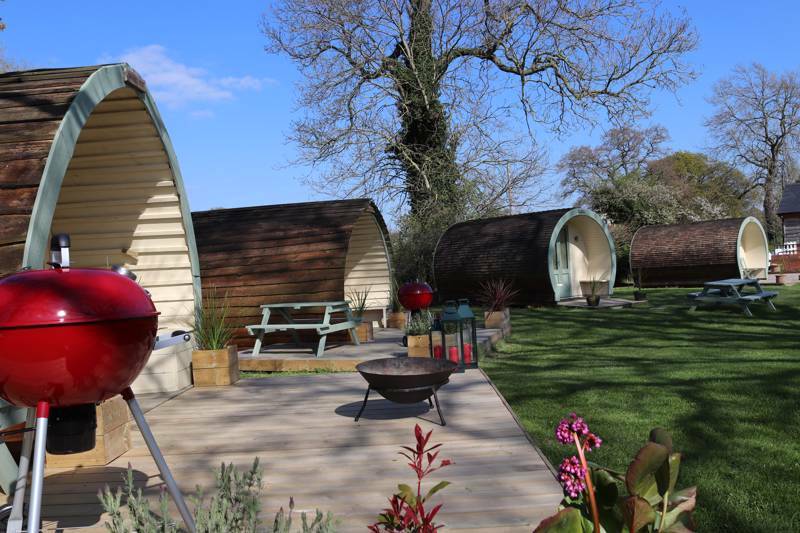 It may be a county with a lot of history, but Shropshire has moved with the times when it comes to camping trends and, these days, there’s lots of choice when it comes to glamping accommodation. Bell tents, tipis, yurts, safari tents, shepherd’s huts and even treehouses - Shropshire has got it all. There are places with hot tubs and plenty of quirky glamping options too from modern geodesic domes to romantic gypsy caravans. We might have a soft spot for back-to-basics camping in tents, but we also know that lots of the Cool Camping clan want their holiday to be a real break – and appreciate a little bit of luxury. That’s why we put as much effort in to selecting our glamping sites as we do with our campsites. We’re not necessarily always looking for the places that have the most expensive sheets (though we may feature them) but we’re looking for places with personality and charm. It might be a site with several basic bell tents or it might be a solo, super-luxury glamping pod with all mod cons. 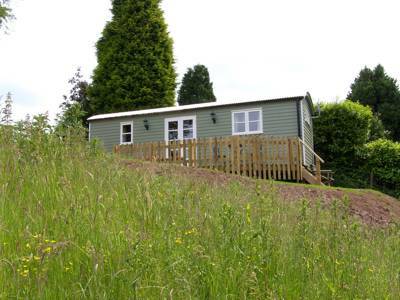 We’ll offer our honest summary of the site so you can find glamping in Shropshire that suits you. There’s no denying the Swallows and Amazons’ appeal of camping. Even as adult, pitching a tent, cooking on a campfire and sleeping with the sounds of nature can feel pretty adventurous. Remember or imagine what that feels like as a child. We can’t recommend camping with kids enough and, believe us, we try - we’ve even written books about it! It’s our experience that kids love camping. Even if it rains, you might notice it’s usually the adults who start to complain. For kids, hiding out in the tent, playing board games and reading books or getting the wellies on and splashing about in puddles can be as much fun as sunshine. The pure joy of camping means any campsite is pretty family-friendly but some are designed and run with children in mind. There are plenty of family-friendly campsites in Shropshire. Some have children’s play areas and activities laid on for younger visitors and some are located close to some of Shropshire’s family-friendly attractions like the living museums at Ironbridge Gorge and the Severn Valley Railway. Whether your kids are tiny tots or turning in to teenagers, camping in Shropshire offers a great family holiday. This landlocked county in the West Midlands is well connected and easy to get to from a huge area of England and Wales, it’s got sights and attractions for all ages and country camping that offers a break from computer screens. Campers without kids, and parents who have a precious weekend away, might be looking for camping that’s especially good for grown-ups. While a majority of campsites welcome campers of all ages, there are a few spots in the UK that keep their camping and glamping sites for adults only. These can be precious bolt holes for people on a romantic weekend breaks or those who just want a quiet getaway. But just because you’re camping without children, doesn’t mean you have to limit yourself to a kid-free zone. The type of campsites we choose tend to offer spacious pitches which mean you won’t be on top of your neighbours. Hopefully this means even if you’re camping with friends and want to stay up late, chatting round the campfire, you can happily co-exist with neighbours whose kids wake up at the crack of dawn. If you’re after seclusion or concerned about noise, it’s always worth asking your campsite hosts for a more secluded pitch. You might also want to consider taking your Shropshire camping holiday outside of school holidays – perhaps even mid-week when there are far fewer campers around. Whether your adults-only camping in Shropshire is a romantic break, a holiday with friends or a solo camping trip, the county offers both plenty of places to explore. The fascinating history of the industrial revolution is explained for all ages at Ironbridge, but without kids in tow, you can take your time to learn more about how Shropshire helped change the world. You can take on more adventurous hiking, cycling and adventure on water when you don’t have to worry about little legs getting tired. Or, of course, you could just kick back at your campsite with blissfully little responsibility but your own rest and relaxation to worry about. Shropshire’s south west is dominated by the Shropshire Hills which link the Midlands to the Welsh mountains. Designated as an area of outstanding natural beauty in 1958, this area of farmland, woods, rivers and, inevitably, hills, is a magnet for campers. There are 300 square miles in the AONB and camping here can offer lovely views and easy access to great walking and cycling. Offa’s Dyke National Trail, which follows the English-Welsh border and the ancient earthwork that divided them in the 8th century, runs along the western edge of the hills and is a great starting point for hiking in the area. The Wrekin, an isolated wooded ridge, is another popular place to walk that’s family friendly but still offers great views. You can park up and walk a mile to the peak for a fantastic panorama. There are also great mountain-biking trails and the quiet lanes and rolling terrain makes for enjoyable road cycling too. However you want to explore The Shropshire Hills, a visit to the discovery centre in the village of Craven Arms will set you up with all the information you need. Shropshire is a landlocked county but it’s still got water, water everywhere. The River Severn flows through the county and cradles Shrewsbury in one of its many meanders. And there are canals too; another of Shropshire’s great attractions. The Shropshire Union Canal is a popular place for narrowboating holidays but you can still enjoy it during a Shopshire camping or glamping holiday. The canal towpaths make a peaceful place for level walking or cycling and there are plenty of slipways if you want to launch your own vessel. Kayak, canoe, or cruise, it’s a great place to take to the water. Waterbabies might also like to call in at Ellesmere. As the name suggests, this place is built by a mere, or lake, where you can hire rowing boats, but it’s also got a canal and a marina too. A visit to Ironbridge Gorge is a must for most visitors to Shropshire. The town is named after, you guessed it, the iron bridge that spans the River Severn. But of course, it’s not just any bridge; built in 1779, it was the world’s first bridge made of iron and a symbol of development in both architecture and technology. The gorge area is rich in minerals and, for hundreds of years before the bridge was built, was busy with various industries but it was a new technique in smelting iron which enabled the bridge and literally put the place on the map. It is said that this set off the series of developments and discoveries that we now call the industrial revolution. With plenty of reminders in the landscape here, from the bridge itself to railway lines and furnaces, the gorge was designated as a World Heritage Site in 1986. More than 200 years after it was built, the iron bridge is still standing and attracting tourists. 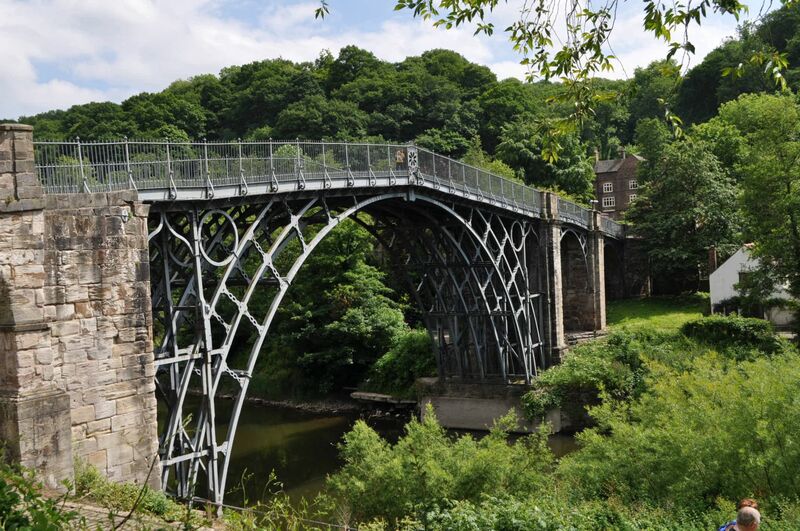 You can walk across it, stand under it and then find out all about the history of the area in a series of museums and attractions that are together called the Ironbridge Gorge Museums. You can buy a ticket to see them all or take your pick to find out about the specific things that interest you from a museum dedicated to iron to a re-created Victorian town that’s sure to be a hit with the kids. There are, blissfully, no cities in Shropshire; instead its main population centres, outside of modern Telford, are historic market towns and villages. Purpose-built in the 1960s Telford is a big town with high street shops and modern amenities. For campers, its main lures are simply as a place for picking up supplies and, perhaps, the cinema, swimming pool or ice rink as a rainy-day activity. Nearby Ironbridge is, rightfully, popular but there are plenty more places you might want to visit on a camping or glamping holiday in Shropshire. Shrewsbury is one. Pay a visit to this market town and you’ll be reaching for the camera as you come across pretty medieval buildings tucked among the ‘shuts and passages’ (alleyways). There’s a castle, museum and independent shops and cafes. Whatever you do, don’t get chatting to the locals about how to pronounce Shrewsbury (or is it Shrowsbury?) – it’s been an on-going row for years. There are more half-timbered buildings along with elegant Georgian ones in Ludlow which also has an 11th-century castle. And you can go further back in history with a visit to Wroxeter. It was the fourth largest city in Roman Britain and its remains are looked after by English Heritage. You can wander the ruins of the bathhouse, step inside a reconstructed Roman home and find out more about the place in the museum. 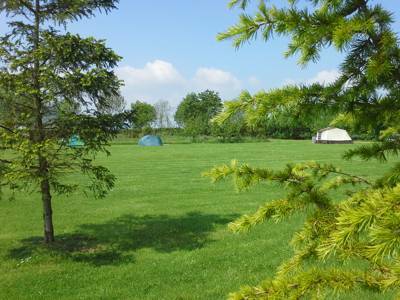 Shropshire at Campsites in Shropshire, Planning a camping trip in Shropshire? 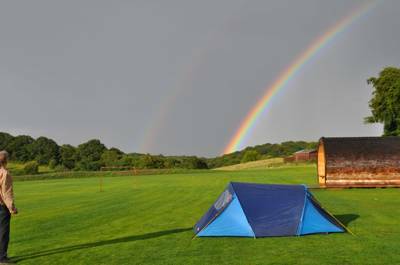 The expert Cool Camping team have brought together all of the county's best campsites in one handy collection, so you can pitch your tent in peace with the guarantee of a great stay.